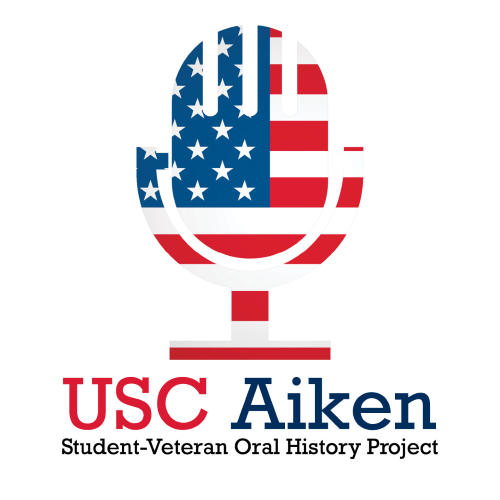 Anson is a student at USC Aiken and signed up for the interview through a campus organization for student veterans. He also filled out a preliminary questionnaire and returned it to the interviewer via email, but the narrator and the interviewer had never met in person prior to the day of the interview. The interviewer is conducting the interview for a project for an Honors 101 course on Oral History at USC Aiken. a) The interview begins with the description of Anson’s early life. He describes his family life, his dad being in the Navy, and growing up in San Diego. He states he graduated from Silver Bluff High School in South Carolina in 2003 and that he was on the football team during high school. Derrick then discusses the reasons he joined the military right out of high school and his family and friends’ reactions to his decision. Next, Derrick discusses his military life, including basic training in Parris Island, SC, being stationed in Cherry Point MCAS, NC, the units he was in, and his two deployments to Iraq. He reflects on how being in the military changed him and his outlook and discusses when and why he decided to leave the military. Derrick also describes the jobs he had after leaving the military and what he liked and disliked about them and his struggle to integrate back into the civilian working world after being in the military. He talks about his time at USCA, what he likes and dislikes about USCA, how it is different being a student veteran rather than a traditional student, his choice of major, and his career goals. Lastly, Derrick discusses his current family and what he hopes to do within the next ten years.